Thanks to Infrascale and the Barrie businesses that joined us at Kenzington Burger Bar this week. We had a tasty burger and beer lunch topped off with a webinar on ransomware. Here are the pics and supporting documents if you’re interested in options to protect your data. Prepping for Ransomware in 2017 – Risks change, and so should you. Protecting your data from the preying eyes of hackers and unwanted surveillance is now a fundamental requirement in today’s cloud solutions. Infrascale’s platform is uniquely built to deliver a truly surveillance-proof cloud. 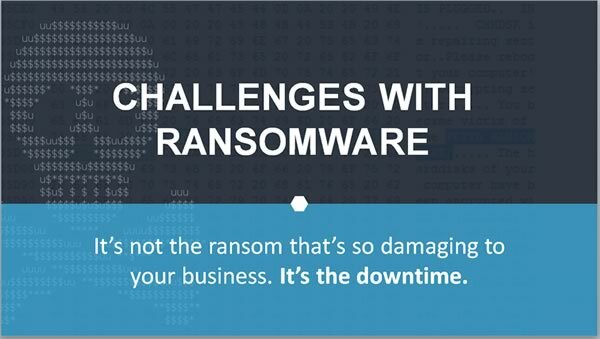 In this 2 min video, you’ll learn how Infrascale’s anomaly detection feature works to help prevent you and your users from having to pay out to ransomware. that: Outdated. A solution is needed that will keep your business prepared for quick recovery, or low RTO (Recovery Time Objective) in the face of disruption. A proper backup solution is only as good as its recovery. 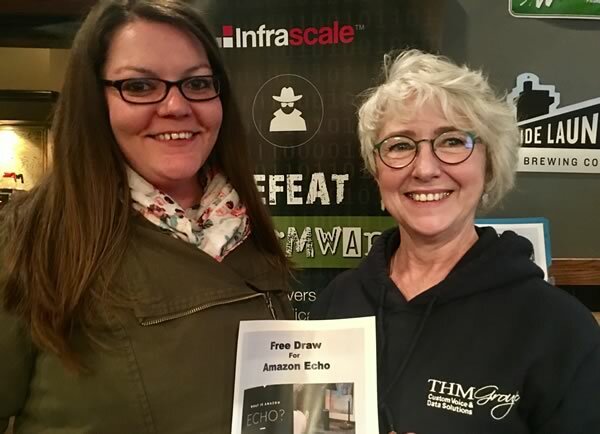 Congratulations to Julie Harris (left) from Tamarco Contracting Ltd., winner of our Amazon Echo draw presented by Tracy Myers (right) from The THM Group. 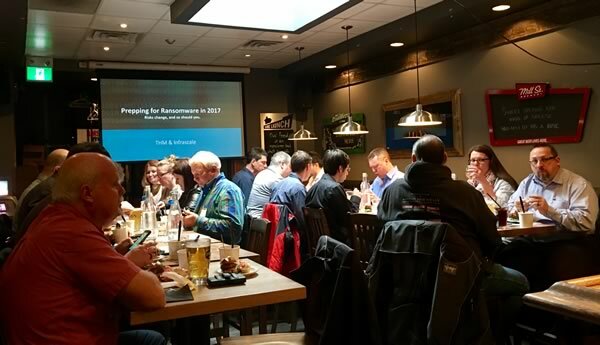 Local Barrie business people enjoying a burger and beer at Kenzington Burger Bar before Derek Wood presented “Prepping for Ransomware in 2017”. Sales Representative for Disaster recovery as a service (DRaaS) When was the last time you updated your on hold message?